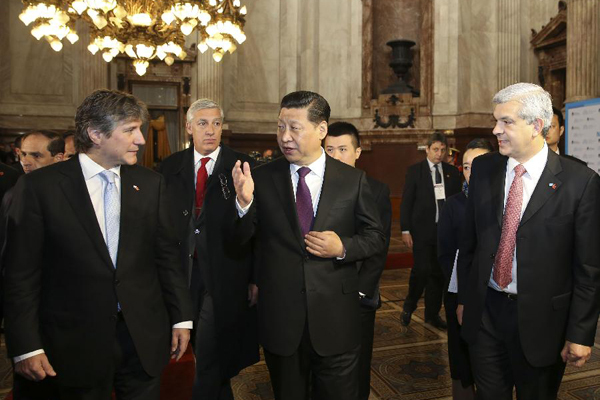 Chinese President Xi Jinping said here Saturday he hoped the legislative bodies of China and Argentina could enhance exchanges and mutual learning so as to help promote bilateral ties. The visiting Chinese leader expressed his hope when meeting Amado Boudou, Argentina's vice president and head of the Senate, or the upper house of the Argentine National Congress, and Julian Dominguez, president of the Chamber of Deputies, the lower house. The Argentine National Congress embodies the country's public opinion, and its support to developing the China-Argentina ties has cemented China's determination for friendly cooperation, Xi said. He spoke highly of the exchanges between China's National People's Congress (NPC) and the Argentine National Congress, which helped enrich the content of bilateral relations. According to Xi, he has had resultful talks with his Argentine counterpart Cristina Fernandez de Kirchner on Friday, when they decided to upgrade the two countries' relationship to a comprehensive strategic partnership. "The China-Argentina relations now stand at a new starting point in history," he stressed. The two sides should see each other as development opportunities and partners, boost mutually beneficial cooperation in an effort to promote common development, Xi said. For their part, the two leaders of the Argentine National Congress lauded Xi's visit as a strong boost to mutual trust and cooperation, and its profound impact in promoting bilateral relations. The Argentina-China cooperation is conducive to achieving common development, intensifying the unity and cooperation among emerging markets and developing countries, and promoting the establishment of a more just and rational international order, said the two leaders. Boudou and Dominguez also pledged the support of the congress and all political parties in their country to the development of the Argentina-China ties. Argentina is the second leg of Xi's four-nation Latin America tour, which has already taken him to Brazil and will later take him to Venezuela and Cuba.